Martinez, J.J.; Martínez, M.; Ortiz Castelló , M.; Talaya, J.; Barón, A.; Rodríguez, G.; Martin-Davila, J.; Bonnefond, P.; Gárete-Martín, J.; García, C.
Three preliminary camp aigns for TOPEX /POSEIDON (T/P) wer e made in March 1999 and July 2000 and for JASON-1 in August 2002, in the NW Mediterran ean Sea at th e Begur Cape area. Dir ect abso lute altimeter calibration , and mapping of the sea surface, w ere made in these camp aigns from dir ect overflights using GPS buoys with a toroidal design performed at the I CC based in the orig inal design of the Univ ersity of Colorado at Boulder and a estimation of the TOPEX A lt- B bias w as made. A Spanish JASON-1 geoid gradien t campaign with Fench support has been made in June 2003 at the Ibiza island in the NW Mediterr anean Sea. Th e main objectiv e has b een to map w ith a new d esign ed, builded and calibrated GPS catamar an, the lo cal geoid gradien t in three ar eas around Ibiza island under the ascending (187) and descending (248) Jason-1ground tracks. The catamaran equ ipped with two GPS antennas to perform continuous sea lev el measur ements was towed by the Patro l Dev a from th e Span ish N avy. Five GPS reference stations were dep loyed on Ibiza island: one in Portinatx, two in San Anton io and two in Ibiza. The marin e geo id has been used to relate the coastal tide gauge data from Ibiza and San An tonio h arbours to off- shore altimetric data. In th e framework of the campaign, the levelling of the Ibiza and San Anton io tide gauges to the r espective GPS mark ers w as p erformed. We present synth esis of the resu lts obtained from Topex/Poseidon and th e first r esults on Jason-1 altimeter calibration using the direct measurements from GPS buoys and the derived marin e geoid. Th e Ibiza results agree relativ ely w ell with resu lts ob tained at Corsica, Harvest and Bass Strait calibration permanen t sites. Moreov er, the geod etic activities (e.g., GPS, levelling) has p ermitted to build a very accurate (few mm) local n etwork link ed to th e European one, w ith a reference frame compatible with th e satellite altimetry missions (ITRF2000). The GPS kinematic data wer e processed using two d ifferen t sof twar es allowing to check th e consistency of the solutions. A perspective of a new Jason-1, in cluding Envisat, Ibiza campaign to be made around 2007 will be pr esen ted. These camp aigns w ere supporte by th e Span ish Ministery of Scien ce and Technology under projects of the N ational Space Program ref : ESP1997-1816-CO4- 03 and ESP2001-4534-PE. Martinez, J.J. [et al.]. Experiences on altimeter calibration at Ibiza island and Cape of Begur (Spain). A: Symposium on 15 Years of Progress in Radar Altimetry. 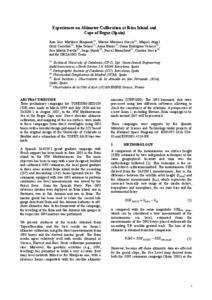 "Proceedings of the Symposium on 15 Years of Progress in Radar Altimetry : 13-18 May 2006, Venice, Italy". Venècia: European Space Agency (ESA), 2006, p. 1-5.